At Nebraska Appleseed, we think of our poverty-fighting efforts as building a ladder that leads people out of crisis. Public services can and should work this way – finding people who have fallen into poverty, then connecting them to programs and resources that lead to true financial independence. Up and up. Step by step. 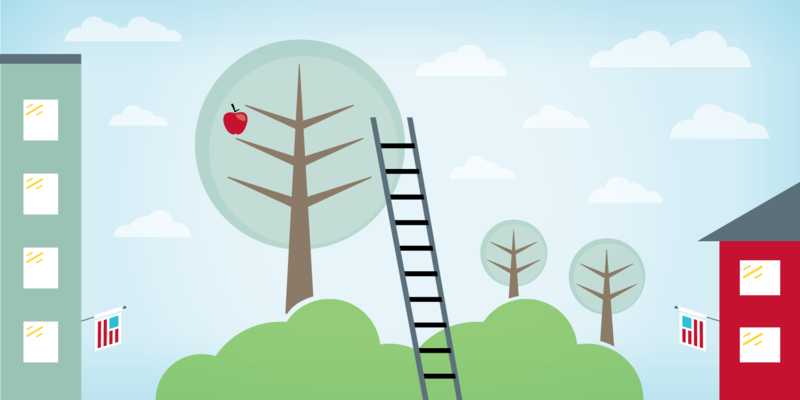 If you imagine that ladder, Nebraska Appleseed’s work is focused on filling in the gaps – fixing broken rungs or building new ones. When we find a problem, we look past short-term or surface solutions to get to the underlying need. And we try to think about the entire system. What help do people need now? What will they need next? Is there a clear pathway to financial security? Our work is motivated by hope and confidence. We believe that most people can reach financial independence if the path out of poverty is clear. Appleseed believes education and skills training are the quickest ways to open doors to opportunity for all Nebraskans. We work with our state’s leaders to offer flexible, affordable programs for working adults to go to classes, and offer support services that help low-income families work towards their success. More than ten percent of Nebraskans don’t know where their next meal will come from. Nebraska under-utilizes federal nutrition programs and we work to fill in those gaps. Appleseed promotes policy changes that give Nebraskans access to stable food assistance. Public assistance programs help families meet their basic needs. Appleseed works to strengthen these systems so people have help when they need it, and protects the rights of the Nebraska families to have full access to critical services. From time to time, Nebraska Appleseed takes to the courtroom to fight for systemic changes that protect the legal rights of our state’s families. Through the legal system, we aim to hold the state accountable to the fair administration of public programs and ensure fair access to these services for all Nebraskans.